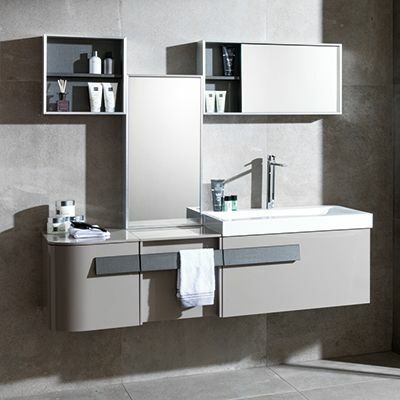 The Flow Series’ wall-mounted sink and bathroom organization units’ design features smooth lines with rounded edges. Its compact design has an impressive amount of storage space, along with a luxurious finish. 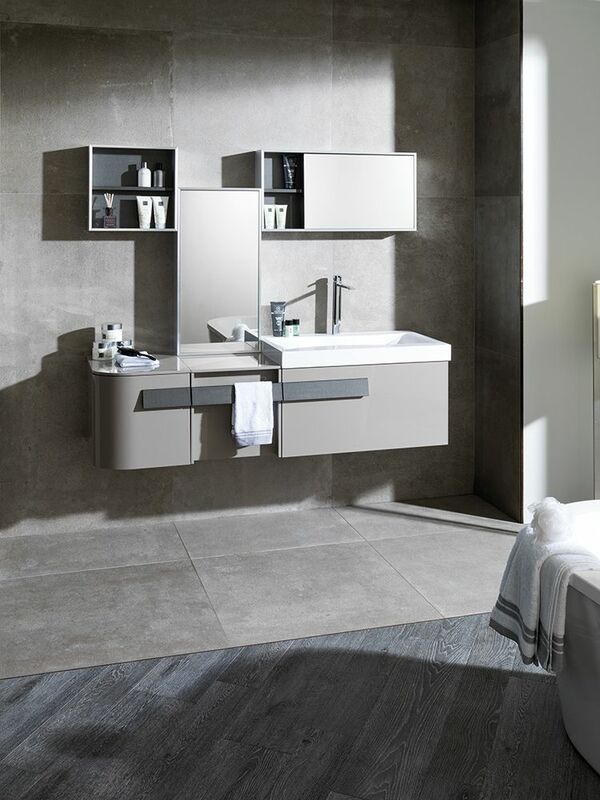 The Flow series is also made out of KRION®, Porcelanosa’s next generation solid-surface material. Because the Flow vanity is made of Krion, it is easy to maintain – with its antibacterial properties, lack of visible joints, and high resistance to damage. High quality & extremely durable hinges standard. Lower modules have potential of installing handle to the right or the left. [G105540006] Blanco - 23 5/8" x 15 3/4" x 20 1/8"
[G105540010] Tortola - 23 5/8" x 15 3/4" x 20 1/8"
[G105540012] Blanco - 31 1/2" x 15 3/4" x 20 1/8"
[G105540005] Tortola - 31 1/2" x 15 3/4" x 20 1/8"
[G105540016] Blanco - 15 3/4" x 16 1/4" x 20 1/8"
[G105540008] Tortola - 15 3/4" x 16 1/4" x 20 1/8"
[G105540021] Blanco - 15 3/4" x 16 1/4" x 20 1/8"
[G105540019] Tortola - 15 3/4" x 16 1/4" x 20 1/8"
[G105540020] Blanco - 15 3/4" x 16 1/4" x 20 1/8"
[G105540015] Tortola - 15 3/4" x 16 1/4" x 20 1/8"
[G105540018] Blanco - 15 3/4" x 16 1/4" x 20 1/8"
[G105540017] Tortola - 15 3/4" x 16 1/4" x 20 1/8"
[G105540014] Acero Inox - 15 3/4" x 15 3/4" x 5 1/8"
[G105540011] Acero Inox - 15 3/4" x 15 3/4" x 5 1/8"
[G105540004] Acero Inox - 15 3/4" x 31 1/2" x 5 1/8"
[G105540013] Acero Inox - 23 5/8" x 15 3/4" x 5 1/8"
[G105540009] Acero Inox - 31 1/2" x 15 3/4" x 5 1/8"
[G105540001] Acero Inox - 23 5/8" x 15 3/4" x 3/4"
[G105540003] Acero Inox - 31 1/2" x 15 3/4" x 3/4"
[G105540002] Gelcoat - 23 5/8" x 5 7/8" x 19 1/4"
[G105540007] Gelcoat - 31 1/2" x 5 7/8" x 19 1/4"
[G105500039] Gelcoat - 23 7/8" x 5 1/2" x 19 3/8"
[G105500038] Gelcoat - 31 3/4" x 5 1/2" x 19 3/8"
[G100350009] KRION® - 23 5/8" x 5 1/8" x 19 3/8"
[G100320004] KRION® - 31 1/2" x 5 1/8" x 19 3/8"